Think about your last vacation. How did you decide where you wanted to go? Was it the sun? The food? Or maybe some of the sights you’d see along the way?Traditionally, when it comes to traveling, it’s about the destination. But sometimes it’s the residents of a destination – the wild locals so to speak – that can make a trip. Welcome to Bonaventure Island, in the eastern section of Canada’s Quebec province, where 54-thousand Northern Gannet couples come to nest and spend their summer vacation. That’s more than 100-thousand birds and we’re not counting the babies. They are loud, and admittedly, a bit smelly, but they’re also pretty spectacular. You take a ferry to the island from Percé, and then jump on a fairly level hiking trail that’s less than four miles roundtrip (5.6km). As you get closer, you’ll start to see birds in the air, but nothing prepares you for that first look. 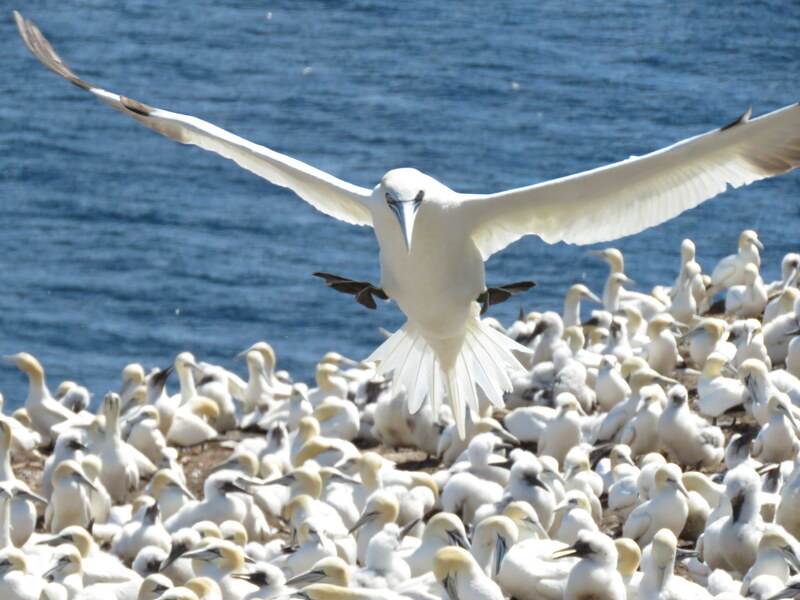 The largest migratory bird refuge in North America, there are many other species of birds on the island as well, but the Northern Gannets have strength in numbers and make their presence known. 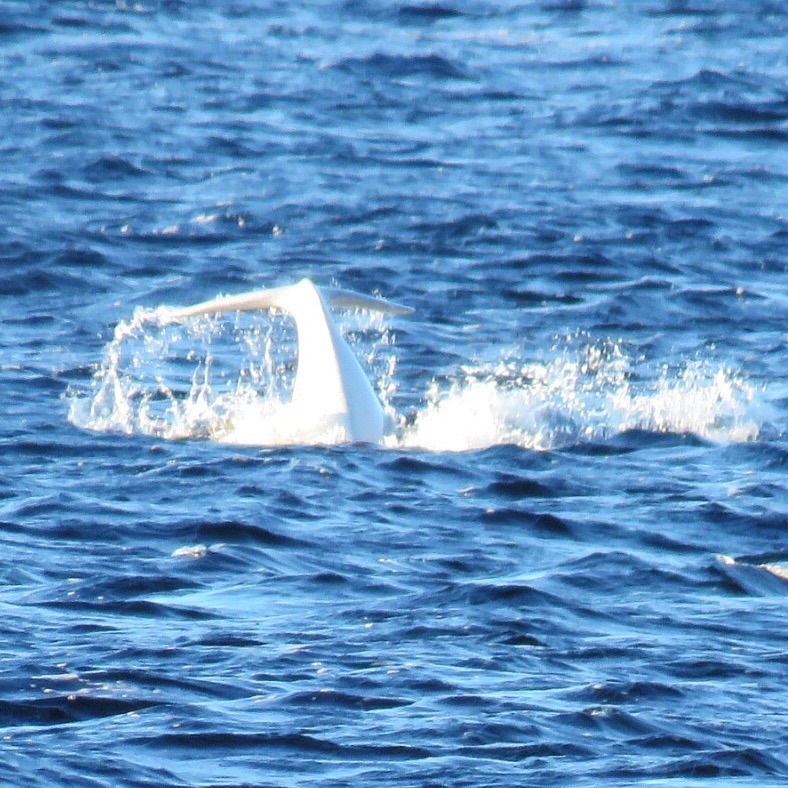 Whale watching is a big favorite with travellers, myself included, but I might have dropped a camera when these guys popped up out of the water in Tadoussac (tah-doo-sack). A little shy of 900 beluga whales live year round in the St. Lawrence Estuary. Boats go out numerous times a day, but I shot these pictures standing on shore. The half mile trail, Pointe-de-l’Islet in Tadoussac delivers walkers front and center to the action. 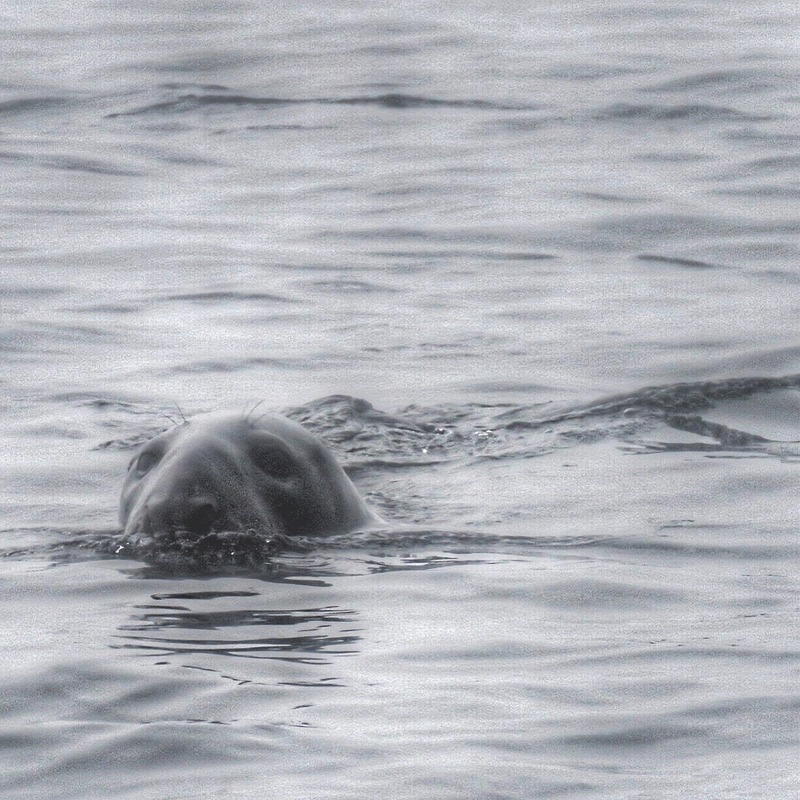 I was however on a boat, a Zodiac whale watching tour on an incredibly foggy morning, when I met a herd of grey seals. Male grey seals can grow to seven-and-a-half feet long, (2.3m) and weigh more than 750 pounds (350 kg). Females are smaller, reaching six-and-a-half feet (2m) in length and weighing up to 500 pounds (227 kg). You can trade fog for sunshine on the Big Island of Hawaii, and tour a Seahorse Farm. The slowest fish in the ocean, only about one in a thousand seahorses survive in the wild. 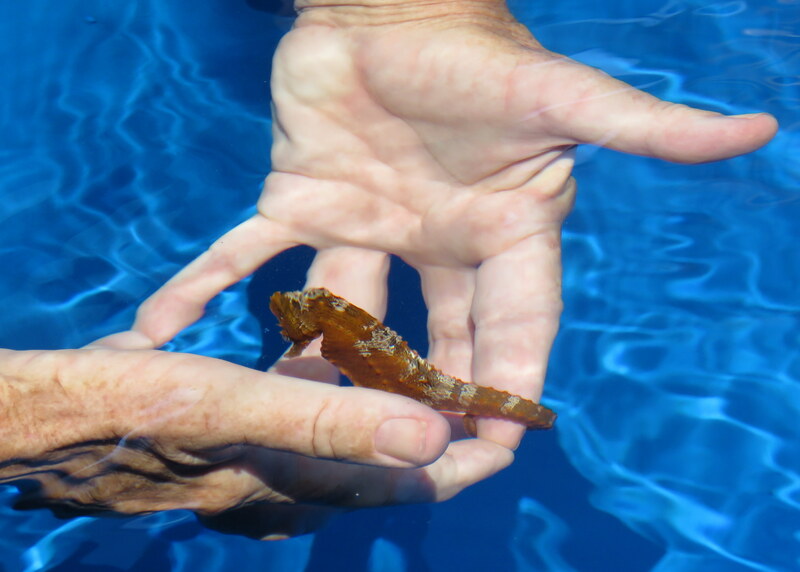 To lessen the chance of seahorses being taken from the wild, the Ocean Rider Seahorse Farm raises seahorses for home aquariums. The tour is only about an hour in length, but biologists pack in an incredible amount of information about these incredibly social creatures, which makes the last part of the tour – holding a seahorse even more amazing. After you submerge your arms up to your elbows, (a thorough hand and arm washing is a tour pre-requisite) they curl their tails around one of your fingers and hang out. That is until they see a friend nearby and head off looking for a better hand to check out. You can save a couple dollars buying tickets online. Last, but certainly not least, there’s Poipu Beach Park, Kauai, a favorite spot for Hawaiian monk seals to sunbathe on the warm sand. 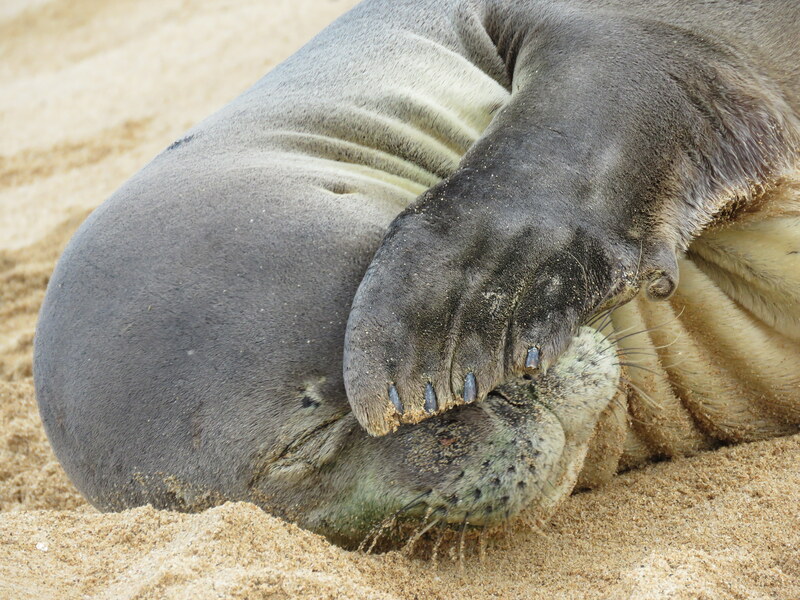 Endangered, there are believed to be less than 50 monk seals on Kauai, but a few seem to be regulars on this stretch of sand. Admire and watch from a distance. Volunteers try to rope off sections of the beach when animals come ashore, but they can’t be everywhere, so use common sense. 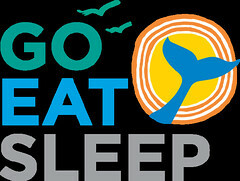 Hawaii has strict laws prohibiting harassing marine wildlife.